Tondaligan Blue Beach in Dagupan City holds a big promise to become the new wind surfing capital as well as a diving site that could thrill local and foreign visitors. This was bared by former city councilor Liberato Reyna IV, an engineer, who was designated chair of the water sports event of Dagupan's Platinum Year celebration this coming June 20. Reyna is a diving enthusiast, one of the few in Pangasinan today. 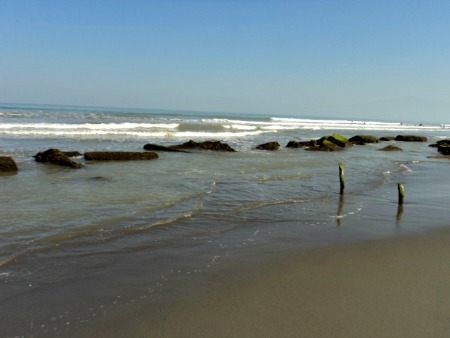 As a former city official, he acknowledged that the Tondaligan Blue Beach by the Lingayen Gulf was much better because of the dramatic changes introduced by the present city administration. It's potential as a wind surfing paradise was discovered when the Philippine Wind Surfing Association (PWSA) came to Dagupan from May 27 to 29 to introduce wind surfing as a sports to local youth. The PWSA was invited by Mayor Belen Fernandez as she wanted wind surfing to become a permanent activity at Tondaligan Blue Beach similar to beach volleyball promoted earlier here by the Beach Volleyball Republic. The coming of the PWSA coincided with the demonstration testing of watercraft sports of Als Marine Inc., the local dealer of Yamaha sports water craft, like jet skis, speed boats, banana boats, band wagon and kayaks at Tondaligan Blue Beach, and gear like life jackets, helmets and others. Reyna said that on the part of PSWA, it brought here members of the national team to hone up for the World Wind Surfing Competition slated in Vietnam on June 10 this year. Reyna said the only known beaches where wind surfing was a regular activity were Anilao, Batangas; Caliraya, Laguna; Boracay and Palawan. But he is confident that after some more promotional activities, Tondaligan Beach will also become one of the best known wind surfing sites in the country because of the gentle breeze from the Lingayen Gulf, especially at this time of the year. The former councilor said they could promote both wind surfing and diving at the same time at Tondaligan Blue Beach since both sports events were complementary with each other in order to attract more tourists to Dagupan. He attested that the new images of cleaner Tondaligan Blue Beach, minus its old unsightly beach sheds, being posted many times on Facebook were real and not photo-shopped.